Kusum Kangaru is both rocky and icy. It is a tibetan name meaning ” Three snow peaks”. 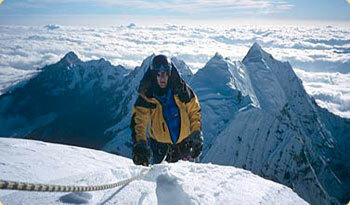 The peak is a very challenging peak and a complex climg,it has three summits. Walking through the Solu Khumbu visit Namche Bazaar; explore Khumjung village and the sweeping views of Mt. Everest, Lhotse, Amadabla, Khangtega and Thamserku. Day 01 : Meet upon arrival at Kathmandu International airport by our representative, transfer to hotel. Day 02 : Sight seeing around Kathmandu valley, overnight at hotel. Day 03 : Fly to Lukla and start trek to Phakding, overnight at lodge. Day 04 : Trek to Namche Bazaar, overnight at lodge. Day 05 : Acclimatization at Namche Bazaar, overnight at lodge. Day 06 : Trek towards Base Camp, overnight at tented camp. Day 07 : Trek to Base Camp, overnight at Tented camp. Day 08-15 : Climbing period, overnight at tented camp. Day 16-17 : Trek back to Namche Bazaar overnight at Lodge. Day 18 : Trek to Lukla overnight at Resort. Day 19 : Fly back to Kathmandu, overnight at hotel. Day 20 : Free day in Kathmandu, overnight at Hotel. Day 21 : Transfer to airport, departure on your own destination.